Douglas Rushkoff , Founder of NYU’s Narrative Lab, is the closing keynote at the CMA’s Word of Mouth Conference . Word of Mouth and Marketing is an oxymoron. Word of mouth happened when communication only happened in a social context. Marketing was developed in an ear of mass media that could be monopolized. They have a very different character. Advertising is over. It’s a modern invention. It’s over because what we think of as “branding” is over. Branding is an artifact of broadcasting culture, of top down communications. The Internet is bringing this era to an end. Our thinking about social media is skewed by our thinking about what was before. Modern brands have replaced the real relationships we have with individuals and small businesses with “mythological” relationships that are constructed through mass media campaigns. Mass production led to mass marketing which led to mass media. Mass production depersonalizes the worker. Mass marketing desocializes. Mass media isolates the invidual audience member. In the social media space, brands are deconstructed as soon as they are communicated. Value is created in a decentralized way by people using something and then communicating it to others. Dumb marketers have tried to do traditional marketing in a viral way. They recruite Paris Hilton for burger campaigns. Burger sales fall. Paris Hilton’s reputation goes up. Marketing fails. Marketers first reacted to new media by porting the old techniques to the new medium. Remember the concept of “sticky” websites? Did consumers really want to be portrayed as flies on flypaper? When other tactics failed, marketers tried to fake it. And they were found out. All of these efforts have been about trying to restore traditional brand storytelling into the new media. And it doesn’t work. We are moving into a single communications space in which advertising will evolve into public relations. The difference between advertising and PR is the difference between fiction and nonfiction in a book store. Advertising is about creating fictions. PR is about explaining what is happening in the real world. In a single communications space, a company can give consumers the social currency to talk about what the company does. They can reach out to people who share a passion for what the company does. And they can rely on those consumers to talk about this. A metric of success for Word of Mouth should be how many people are applying for jobs at your company. How many people think it would be a great place to work? The task of the smart company’s communication/PR department should be to provide people with the information they need to talk about their companies – social currency. That’s when a company achieves transparency – the breakdown of the walls between a company and its employees and consumers. The new word of mouth expert will be the person who starts a discussion inside a company and then let’s the discussion proceed from there. 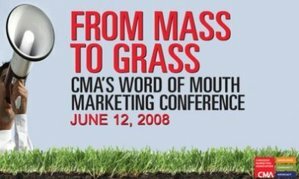 The final panel at the CMA Word of Mouth Conference deals with measurement. Wojnicki: What are the quick and inexpensive measurement tools that everyone should implement tomorrow? Hunter: Conduct surveys to test awareness and perceptions of WOM campaigns. Wojnicki: Should Word of Mouth be campaign or something longer term? What are we measuring? Campaign results? Or longer term reputation? Faulds: Include both organic and accelerated word of mouth. Faulds: BzzAgent recruits consumers to try and discussion products. They measure reach: how many people can be reached? insights: what are people talking about and what are they saying? impact: Are we able to move people’s perceptions fo the brand. And more importantly, can we move sales? It’s easier to measure online WOM. But offline makes up 80-90% of WOM. So, we have to find ways to measure that effectively. Hunter: Impact is the key net measure that should be measured across all programs. The impact I can make measured agains the dollars that were spent. This will enable us to compare campaigns against one another. Wojnicki: Everybody’s jumping on the WOM bandwagon because it’s so pervasive and easily measured online. How do we measure the offline WOM. Hunter; Consumer research will provide the answers for offline WOM. You have to invest in order to learn. Faulds: Whenever there is a new medium out there, people have to measure it with old metrics. It takes some time for new metrics to be developed that fit the new medium. So, with Word of Mouth and “viral,” it will take some time to develop new better metrics. David Usher is being interviewed by Mitch Joel at the CMA Word of Mouth Conference in Toronto. David Usher: I consider myself a storyteller. And when I create music and experience online, I’m still telling a story. As on artist, if you talk about marketing, you’re walking a fine line. Because the audience wants to know that I care pationately about what I’m doing. So that they can share that passion. I use DavidUsher.com as a social networking integration page. I don’t try to control where the content is. I want people to see it wherever they want it. Mitch Joel: How about the music industry? David Usher: We still sell CDs. However, I work online and I make everything available there. David Usher: Artists must learn how to engage their audiences. Some artists will do it themselves. Others will require some source of revenue and outside help to do this. David Usher: Online social networks are good for artists. They help get the word out. Mitch Joel: Talk about the process of making your new album and leveraging all the channels to promote it. Is it different from the era of the big labels? David Usher: I releasing things all the time. I’m using social networks and all the tools to distribute them. David Usher: What has happened to the music business will happen to all businesses. You must all learn to deal with empowered communities who will choose the content they want to receive. David Usher: I don’t send advertising to my community. There’s a distrust of SPAM and I attempt never to offend my fans. David Usher: People are fickle and move fast. You must be out there and engaged in order to spot these changes. Mitch Joel: Do you care about metrics/measurement? David Usher: I look at all the standard metrics. But I look closely at comments. That gives me a sense of what people really care about and think. I respond to comments as much as I can. David Usher: For AC/DC, it’s a smart move. They get their money guaranteed. Today, it’s hard to tell what will sell. David Usher: There’s more of this being done, but the money is coming down. That’s because all artists want to get their music out there. So, there’s no shortage of opportunities for companies to be part of this. Mitch Joel: Why would fans steal music? David Usher: People don’t view it as stealing. And creators will have to adjust their thinking to take this into account. Especially as bandwidth continues to increase, the ability to get music will just increase. David Usher: We sell shows. We’ve always sold shows. I was with EMI Records for 10 years and I don’t think we ever made a dollar off selling records. David Usher: When RadioHead and established artists do things like giving away albums for free, it’s just a stunt. There’s no future model for anyone else. The new model must work for all the new bands. David Usher: To use the new channels, you have to be a specific kind of artist. Most artists don’t want to spend time learning how to do this. I’m not a typical artist in the way that I spend a lot of time figuring this out and using the online channels. Not everyone wants to do this. So, we’re going to lost a lot of great artists and great music. David Usher: The labels are essentially screwed. They are an old model. They’re trying to do a transition into this world. But they’re doing it without any experience in this world. In order to be successful, they have to buy their way in with a merger with other companies that understand this area. Many try to hire kids out of school to be their digital champions. But that won’t change the underlying nature of the company and the business. David Usher: Online reputation for artists, like any company or product, can be affected quickly by a few people with strong views. The fact that I’m active online, that I’m in the space, enables me to participate in these conversations and be part of my own reputation. You cannot buy your way into these conversations quickly and suddenly. You need to be there for the longterm. Communities develop over a long time. You develop your voice and credibilty over a long time. David Usher: The great thing about the Internet is that in the long tail of the world there are lots of people interested in something. They’re spread all over. So, we need to give them a place to come together. Audience question: Is social media a fair game space for advertisers to be part of? David Usher: Companies are having trouble because they’re used to push. Now, they have to understand that they must be part of conversations with people as people decide what they want to hear about. David Usher: Social media is about people talking about ideas and exchaning ideas and authentic conversation. You have to care about what you’re talking about. Don’t advertise. Start a conversation about your passion. David Usher: With mass media, content used to be pushed into a limited number of narrow streams/channel. Now, the Internet is like a vast flat pan. Advertisers will have to find ways to be effective ina totally different way. Audience question: Your opinion on the Canadian copyright legislation and the Michael Geist / Fair Copyright campaign? David Usher: I think [the efforts to police copyrigh online] is irrelevant. The genie is out of the bottle. Music is free. And the idea of suing people is not going to work. As an artist, i’d prefer people to pay for my music, but I don’t think I can change the way they think. I’ll work with the Internet as it is. David Usher: What you want is people listening to and enjoying music. The more they listen, the better. Artists will have to find a way to profit from this. Jay Moonah question: Is the rockstar system dead? David Usher: There will always be people who come to the fore. But it’s changed in size and scope. It’s a bit more like a village now. I’m not sure whether we’ll have any more Madonnas. It’s a much different game. David Usher: You need to be out front trying out the new channels and methods. Otherwise, you doom yourself to the diminishing returns of yesterday’s tools and channels. You have to decide. Do you want to be at the back of the pack or are you prepared to make an investment in testing the new. But there will always be some individuals particularly skilled at sifting through the mass of content and finding the gems. Won’t this ultimately result in a very similar ‘system’, just different players? David Usher: I’m very interested in the space. What I look for is how things feed – how messages get out without being too intrusive. It’s the networks that do this well that are really appreciated. Scott Brooks: Will we see Music as a Service along the lines of the Software as a Service? David Usher: There are a lot of people trying these types of models. I’m building an application along these lines myself.